Arcane Intern (Unpaid) is a Twine piece with three endings, in which the player goes to work at a publishing house that turns out to be tangled up with actual magic; it’s a branch-and-bottleneck structure with an intro, three segments with light puzzles and exploration, and a conclusion. I played to all three endings. Arcane Intern (Unpaid) is a story about being a muggle. The protagonist goes to work for a publishing company and, after being hired, receives a sigil that lets her perceive the magic around her. But she’s only allowed to keep it as long as she works there; other magical creatures are often prejudiced against her because she’s not “really” magic; and many of her superiors are condescending or unpleasant about it. Systems of power are jealously guarded in this world, even if they take a different form than in our own. A couple of other reviewers have mentioned that the game grew on them through play. I had the same experience. The opening underplays its hook, I think — it could have done more with the wonder of the situation, or with the characterization of the protagonist, or with setting up the essential conflicts here. It does give us a little framing for the protagonist’s financial situation: an inheritance from her grandmother, money that is running out, and her father’s sense that she might be doing the wrong thing. But the game doesn’t dig into this terribly deeply. There’s also an interview scene that could have characterized the protagonist a bit more (or let the player do the characterization), but even seemingly important choices like whether or not you initially believe in magic have no subsequent effect on the flow of the game. It maybe doesn’t help that your first of three tasks is to go get coffee from a magical Starbucks-equivalent. The story tells us in so many words that this is a powerful experience for the protagonist, but it doesn’t really evoke the wonder for the player; the draconic barista and witch customers might almost be Halloween partiers in a real-life city. Magicworld works a lot like our world, it turns out. Later, though, the story opens out a bit, both revealing more about why magic might be interesting and giving the player a stronger investment and more freedom. In the middle task of the game, there are several different ways the puzzle can go. The protagonist can wind up helping some of the NPCs or not really connecting with them at all. Despite their glitz, the magical aspects are less critical to the story than the negotiation of alliance with other creatures (human or not) inside the power structure. And of course the company makes shameless use of the protagonist — of her ambitions and her optimism, absorbing her labor without paying her, using up her minimal finances — with no sense of reciprocal obligation. The game’s final question is about choosing to stay aware, or not, of what you’ve learned; and about whether and how you share that awareness with others. Other suggestions if you enjoyed this one: if the combination of satirical office life and high magic appeals to you, check out Max Gladstone’s Choice of the Deathless; if you like gentle fantasy Twine with surprising imagery, you may also want to try S. Woodson’s work. And if you’d like to play another work about a muggle protagonist faced with a magic universe, here’s Flourish Klink’s Muggle Studies. 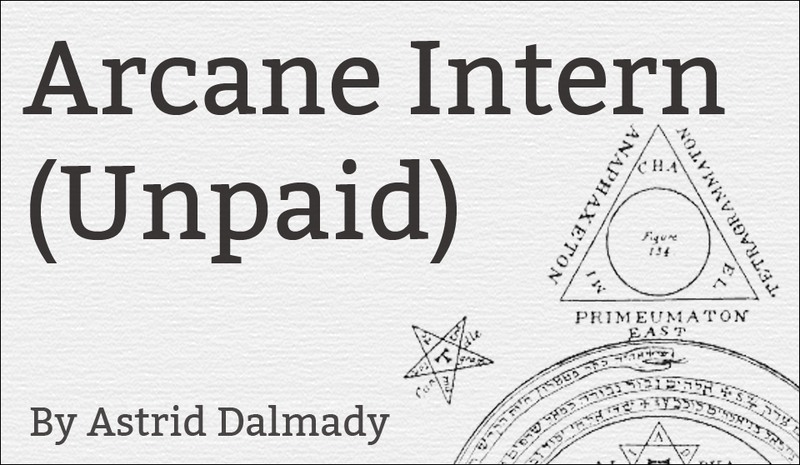 This entry was posted in Competitions, CYOA, Reviews and tagged arcane intern (unpaid), astrid dalmady, twine by Emily Short. Bookmark the permalink.